Patient and public involvement (or ‘PPI’ for short) means researchers working with patients and members of the public in all or any parts of research. This could include choosing the research topic, prioritising from a list of research ideas, designing, planning and doing research, and communicating the findings of research to different groups of people. PPI is becoming increasingly common in health research, including clinical trials, which are a common way of testing new medicines and other treatments. This paper describes a survey we did to find out what kind of PPI is happening in 71 surgical trials in the United Kingdom. (By ‘surgical trials’ we mean clinical trials which test a new type of surgery, or some other treatment in patients who are having or have had surgery.) We also talked to 54 people interested in surgical trials, to find out what they think about PPI, and how it could be improved. Almost all the surgical trials in our survey (92%) were doing some kind of PPI. This was most common at the beginning of the trial (helping to design it) and at the end of the trial (helping to communicate the findings to different groups of people). It was more common for patients and members of the public to be involved as independent advisers than as members of the trial team. The most common thing they were asked to do was help design the patient information sheet. This is the information given to patients when they are invited to take part in a clinical trial. The people we spoke to had experienced some challenges with PPI in surgical trials and had different opinions about how PPI should be done. These included whether to involve patients with the health condition being studied or lay members of the public, how to find patients and members of the public to be involved, and whether or not to pay them for their time. They also suggested some ways PPI could be improved, such as having written ‘job’ descriptions and building up a database of people interested in being involved. Some questions remain about who best to involve and how, and we hope future research will be able to answer these. Patient and public involvement (PPI) in research has been defined as ‘research being carried out “with” or “by” members of the public [including patients] rather than “to”, “about” or “for” them’ . This includes, for example, working with research funders to prioritise research, offering advice as members of a project steering group, commenting on and developing research materials, and undertaking interviews with research participants . Clinical trials in the UK have experienced a recent surge in PPI activity, partly because the National Institute for Health Research (NIHR) now expects active PPI in the research it funds . There is also a new research agenda for PPI in clinical trials  and resources to facilitate the planning, reporting, and evaluation of PPI [4–6]. Despite an increasing focus on the importance of PPI in trials, in a cohort investigation of NIHR- funded trials conducted between 2006 and 2010 only 25% of surgical intervention trials detailed PPI in the outline grant application, compared with 75% of other clinical trials (p = 0.01) . Similarly, in a systematic review of PPI in surgical trials in 2014, PPI was rarely reported in publications , although an absence of reporting does not necessarily mean an absence of PPI. In this study, we sought to: 1) identify and describe current PPI practice in surgical trials; and 2) explore the views and experiences of surgical trial staff and PPI contributors (involved patients and members of the public) in relation to these practices, including their advantages and disadvantages. This study comprises the first and second stages of a larger project funded by the MRC Network of Hubs for Trials Methodology Research to develop a PPI intervention aimed at enhancing recruitment and retention in surgical trials (PIRRIST) . In order to develop an effective intervention, we needed to first identify baseline PPI activity among UK surgical trials. The primary objective of this survey was to ascertain current PPI practice in UK surgical trials. We also explored respondents’ attitudes towards PPI. Where possible, we used or adapted items from existing PPI questionnaires (from outside surgical research) to formulate our initial survey questions [7, 14–19]. We then piloted the survey iteratively with a convenience sample of 13 trial staff, including nine trial managers and four clinical investigators. Cognitive debriefing, namely the ‘think aloud’ technique, was used with each pilot participant (either face-to-face or by telephone) to identify difficulties in interpreting or responding to questions. Piloting continued until no further changes were required. The final survey (Additional file 1) took participants 10–15 min to complete. It mainly consisted of closed questions, with optional free-text comment boxes on every page. As a starting point, we used the definition of PPI provided by INVOLVE  (a national, government-funded advisory group for PPI in health and social care research) and added further clarification during piloting. The final definition of PPI used in the survey is shown in Table 1. By ‘PPI’ we mean researchers consulting with or working alongside members of the public, patients, service users, and/or carers in all or any part(s) of the research process, including the choice of research topic, design, planning, conduct, and/or dissemination of research. In this survey we refer to these people as ‘PPI contributors’. PPI contributors may be, for example, grant co-applicants, members of the Trial Steering Committee or Trial Management Group, members of a patient or lay advisory panel, or participants in a trial-specific consultation exercise such as a focus group, survey, or interviews. Consultation exercises may or may not use formal research methods. By ‘PPI’, we do not mean researchers recruiting people to be participants in the trial, or researchers disseminating information about the trial to patients or the public. Trials eligible for the survey were active, UK-led trials of surgical interventions or other interventions in adult surgical patients. ‘Active’ meant that they were in set-up (i.e. funded and pending regulatory approvals), open to recruitment, or closed to recruitment and in follow-up. A search of the UK Clinical Research Network (CRN) online database of portfolio studies  listed under the ‘surgery’ specialty. The UK CRN portfolio of studies consists of high-quality research studies that are eligible for consideration for support (in developing, setting up, and delivering high-quality clinical research) from the NIHR-funded Clinical Research Network in England. At the time of this survey, the database was publicly available via the UK CRN website. The Royal College of Surgeons portfolio of surgical trials in England. 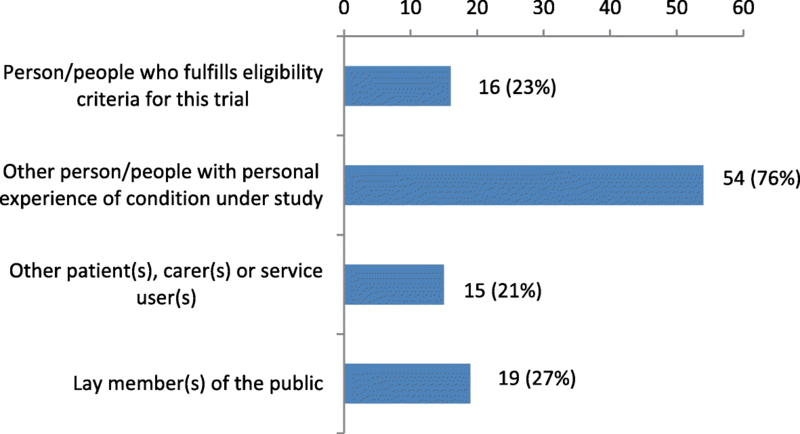 Knowledge of eligible trials through personal connections. We identified 129 eligible trials and sent a personal email invitation to the primary contact listed for each eligible trial. In the invitation, potential participants were offered a £10 high street shopping voucher or academic book voucher as a ‘thank you’ for their time; this was sent by post on completion of the survey. Personal email reminders were sent to non-responders at 2 and 4 weeks after the initial invitation. The survey was open for a total of 12 weeks between September and November 2015. Our participant information sheet was based on a user-tested template developed by Knapp et al. , and we used the Bristol Online Surveys tool  to deliver the survey. The identity and contact information of respondents were requested at the end of the survey to enable us to keep in touch with respondents and deliver thank-you vouchers, but this was optional and respondents could complete the survey anonymously if preferred. However, we did ask for the trial name or acronym at the beginning of the survey to check eligibility and carry out a response bias analysis. Respondents did not have to complete the survey in one sitting (there was a ‘finish later’ option), but their responses were not submitted until completion of the whole survey. In the hope of increasing the response rate to personal invitations, prior to and during the survey period we carried out several awareness-raising activities among surgical research staff: 1) seminars to staff audiences at six academic surgical research centres in the UK (Oxford, Aberdeen, Bristol, Birmingham, London, Leicester); 2) an online blog published on the NIHR Oxford Biomedical Research Centre website; 3) promotional flyers distributed to delegates at the UK Trial Managers Network annual meeting; 4) a national webinar hosted by the MRC Network of Hubs for Trials Methodology Research—Trial Conduct Working Group; 5) promoting the study via Twitter; and 6) informing personal contacts. We exported the survey data into IBM SPSS Statistics 22 and generated simple statistical summaries of the closed form responses to each survey item. Free-text qualitative data were grouped thematically and used to aid interpretation of the quantitative data where relevant. Data were checked for inconsistencies and respondents contacted for clarification where necessary and if they had given their permission to be re-contacted for this purpose. We explored whether trials funded by the NIHR (fully or partially) and with later recruitment start dates would be more likely to have PPI in the funding application. For both factors, a difference in the percentage of trials with PPI in the funding application was calculated with the 95% confidence interval (CI) using Newcombe’s model 10 using the rdci command in Stata version 15. We hypothesised that our sample of respondents would be biased towards those with experience of PPI in surgical trials (since the topic would be of greater interest to people already doing PPI). In order to test this hypothesis and estimate the degree of response bias, we obtained relevant data from the National Research Ethics Service (NRES) through a Freedom of Information request for each trial invited to take part in the survey. These data consisted of the responses (including free-text comments) to question A14–1 of the NRES application form: “In which aspects of the research process have you actively involved, or will you involve, patients, service users, and/or their carers, or members of the public?” A researcher (JCC) used this information to code each trial as ‘PPI’ or ‘No PPI’. A difference in the percentage of trials with PPI between responders and non-responders was calculated using the same method as noted above. In the context of the wider PIRRIST project, the primary objectives of this applied qualitative research were to explore: 1) views and experiences (especially challenges) of recruitment, retention, and PPI in surgical trials; 2) views about the impact of PPI on recruitment and retention of surgical trial participants; and 3) possible ideas for the PIRRIST intervention. This paper focuses on the first of these objectives in relation to PPI. Eligible participants were UK-based current surgical trial staff (any role, including PPI coordinator) and PPI contributors with combined experience of PPI, clinical trials (any intervention) and surgery or surgical research. Eligible trial staff were identified from stage 1 survey respondents, open adverts (via email and Twitter) distributed to and cascaded by regional and national PPI and surgical networks/groups, and our own professional contacts. Prior to conducting the focus groups, we also published a promotional article in the Bulletin of the Royal College of Surgeons of England . Interested potential participants were asked to indicate which of four sites (Oxford, Aberdeen, Birmingham, or Bristol) they would prefer to attend. Potential participants at each site were then asked to complete a Doodle poll showing their availability. Travel bookings and overnight accommodation were offered to ensure that geography was not a barrier. We aimed to recruit eight participants per focus group with a diverse range of roles and experiences; staff focus groups had to include at least one trial manager, principal investigator, and research nurse. Dates which best fulfilled these criteria were chosen. Potential participants who were unable to join a focus group, as well as the focus group participants themselves, were invited to submit (additional) comments in writing if they wished. To maximise participation by PPI contributors, those unable to attend a focus group were offered an alternative one-to-one interview in person or by telephone. Focus group and interview participants were offered a £20 high street shopping voucher or book voucher as a ‘thank you’ for taking part. Focus groups were facilitated by a non-clinical member of the research team (JCC), who used a semi-structured topic guide covering the following: experiences of PPI; experiences of participant recruitment and retention; participants’ views of the impact of PPI on participant recruitment and retention (including how this happens); and ideas for the PIRRIST intervention. The focus groups were audio-recorded, and an observer (KPB) took notes to aid transcription. The audio-recordings were transcribed verbatim, checked, and anonymised before undergoing thematic analysis . The first full transcript was coded deductively by three researchers independently (JCC, KPB, JH) against the pre-specific topics of interest: views and experiences of PPI; suggestions for improving PPI; participant recruitment; participant retention; impact of PPI on recruitment; impact of PPI on retention; other impacts of PPI; ideas for PPI intervention. The coding was discussed, agreed, and transferred to NVivo. The coding reports (coded text within each of the pre-specified topics) were then coded inductively by the same three researchers, and a preliminary thematic framework was agreed. This framework was then applied to subsequent transcripts independently by two researchers (JCC and KPB), who regularly discussed, agreed, and refined the framework. Themes which emerged from analysis of the focus groups were mapped against the themes covered in the survey to identify areas of overlap. In this paper, we present the findings under cross-cutting themes (i.e. those for which we have information regarding both the frequency of practice and people’s views and experiences of the practice). Participant ID numbers are provided where direct quotations are used, with ‘SR’ indicating a stage 1 survey respondent, ‘PS’ indicating a stage 2 staff participant, and ‘PP’ a stage 2 patient or lay participant. The notation ‘[…]’ is used to indicate where verbatim text has been excluded from the quotation. In some cases, details have been removed and replaced with broad descriptors (e.g. ‘[medical condition]’) to ensure anonymity. The idea for the PIRRIST study emerged from meetings with an advisory panel for JCC’s research fellowship, which was funded by the NIHR Oxford Biomedical Research Centre to research PPI impact assessment. The advisory panel included two patient advisers (including author AC), who were involved in the group to ensure that the research was relevant to, and informed by the perspectives of, patients and members of the public. They were chosen because of their long-term experience of PPI and interest in assessing its impact. The decision to undertake the PIRRIST study (and an accompanying systematic review ) was in part due to our patient advisers’ desire to measure the impact of PPI, particularly on patient recruitment to clinical trials. Whilst the study was underway, one patient adviser (MO) retired and a third (RH) joined the group. These patient partners provided input at six advisory group meetings and email correspondence between meetings, and one (AC) was co-applicant on the project grant and continued to be a member of the study team throughout. A second lay partner (JB) joined the study team once funding had been secured. As well as helping to conceive of the PIRRIST study, the patient partners and advisers helped to design the overall study and its patient-facing materials (online survey, focus group topic guide, information sheets, invitations, and adverts), promote the study to wider patient/PPI groups, and interpret the findings. As a team, we believe that PPI is worth doing but that it should be evaluated to improve practice and maximise value. Of 129 eligible trials that were identified, and the primary contacts invited to take part, 71 (55.0%) participated in the survey. We were unable to source NRES PPI data for 29 (22.5%) of the invited trials because the question about PPI had not been implemented at that time or NRES was unable to retrieve the data. For the 99 trials with NRES PPI data available, 49/56 (87.5%) survey responders reported PPI or plans for PPI in the NRES application form, compared with 33/43 (76.7%) non-responders, with a difference in percentage of trials with PPI input of 11% (95% CI −4 to 26%). At the time of survey completion, 7 (9.9%) participating trials were in setup, 46 (64.8%) were open to recruitment, and 18 (25.4%) were closed to recruitment and in follow-up. Recruitment start dates ranged from July 2004 to June 2017 (median July 2013). Of these trials, 54 (76.1%) were funded by the National Institute for Health Research, 6 (8.5%) by another public funder, 16 (22.5%) by a charity, and 3 (4.2%) by industry. (These categories are not mutually exclusive; 8 trials (11.1%) had multiple funder types.) Cancer, cardiovascular disease, and musculoskeletal conditions were the most common clinical specialties (16 trials; 22.5% each). The survey respondents included 40 (56.3%) trial managers, 17 (23.9%) chief investigators, 6 (8.5%) co-investigators, 6 (8.5%) other trial staff, and 2 (2.8%) PPI coordinators. They represented a wide range of views on PPI (Table 2), although the vast majority of respondents agreed or strongly agreed that PPI is morally/ethically the right thing to do (91.5%) and that PPI can make a positive difference to surgical trials (87.3%). A total of 54 people (including 31 surgical trial staff, 21 PPI contributors, and 2 PPI coordinators) took part in stage 2 between January and June 2016. We conducted six focus groups: four with surgical trial staff (at the universities of Oxford, Aberdeen, Birmingham, and Bristol) and two with PPI contributors (both at the public library of Birmingham). In addition to the focus groups, we carried out seven one-to-one interviews with PPI contributors (two face-to-face and five by telephone) and received 11 written contributions. Sixty-five (91.5%) surveyed trials reported that there was, or had been, PPI in the trial according to our definition. The most commonly cited reasons for including PPI in the trial were that it was considered morally/ethically the right thing to do, that it was believed to result in better research, and that it was required by the funder(s) (Table 3). Five of the six trials which did not have any PPI gave at least one reason: PPI was not a requirement when the trial was set up (n = 4); PPI was unlikely to improve the trial (n = 3); and the trial team had tried but failed to identify PPI contributors (n = 1). Who were the PPI contributors? Of the 71 surveyed trials, three-quarters had PPI contributors with personal experience of the condition under study but who did not fulfil the eligibility criteria for that trial, while a minority of trials had other patient(s), carer(s) or service user(s), lay members of the public, or patients who fulfilled the eligibility criteria for the trial (Fig. 1). Lay people were also seen as more able to commit to long-term trials than patients with serious conditions: ‘…if you’ve got palliative patients they can’t sort of sit on steering group and the trials that go on for years.’ (PS25, PPI coordinator, focus group 4). How were the PPI contributors recruited? The most common way in which PPI contributors were recruited was through asking people the trial team already knew, particularly patients or former patients of a clinician on the team (Table 4). Nearly half of the trials approached an established group, service, or organisation, while very few used open adverts. In only two cases did PPI contributors approach the trial team. Where did PPI feature in the research process? PPI in choosing the research topic or question was reported by fewer than one quarter of trials, while PPI in developing the funding application and data collection tools were each reported by approximately half of trials (Table 5). PPI plans seemed to be fluid, with some free-text comments indicating that PPI might be added at later stages of the trial, particularly at dissemination. Trials funded by the NIHR were not more likely to have PPI in the funding application (48% vs. 41%; 7% difference, 95% CI −19 to 31%), nor were trials with a recruitment start date on or after the median of 1st July 2013 (54% vs. 38%; 16% difference, 95% CI −7 to 37%). The majority of surveyed trials had at least one PPI contributor on the Trial Steering Committee (72%), while fewer had a PPI contributor as grant co-applicant (35%) and/or member of the Trial Management Group (35%) (Table 6). Over 60% of trials also consulted PPI contributors out-with these roles; methods included focus group or group discussion (n = 25), interviews (n = 21), email consultation (n = 11), survey (n = 6), online group discussion or forum (n = 1), and other informal methods. Other roles mentioned by survey respondents in free-text included PPI membership of the independent Data Monitoring Committee (n = 1) and PPI in investigator training and interviewing for the trial physician post (n = 1). However, one participant warned of the difficulty initiating this kind of arrangement, because ‘the Trial Manager is often not involved in the trial when this sort of group needs to be set up’ (SR69, trial manager, survey respondent). ‘But one of the other things in [Borough] as well that was pointed out to me, was that they felt, with hindsight, that you needed to make sure that the PPI representatives had a very accurate description of what their roles and responsibilities were at the outset, so that they knew before they actually consented to take part really, about what they were taking on… (PS09, research nurse, focus group 2). Our survey findings suggest that PPI has started to become routine practice for UK surgical trials, with over 90% of surveyed trials reporting some kind of PPI. Patients and members of the public were reportedly involved in a variety of different ways, most commonly at the design and dissemination stages (relative to the trial conduct and data analysis stages) and in oversight or advisory roles (relative to partnership or management roles). The single most common PPI activity was developing participant information sheets (72% of surveyed trials), but there was evidence that this was sometimes tokenistic, and general agreement that PPI should be started earlier in surgical trial design. A two-tier model of PPI, in which a small number of PPI contributors are closely involved with the trial team and linked to a larger group of patients, was seen as beneficial because it resulted in a better representation and patient engagement than the involvement of one or two PPI contributors alone. This is consistent with the finding of a realist evaluation that a similar ‘outreach’ model of PPI, in which lay representatives are linked to broader communities, was an effective and efficient model of PPI in clinical research . Almost none of the surveyed trials included participants from the trial as PPI contributors. However, one PPI focus group participant suggested that input from trial participants would be a useful form of PPI, and expressed frustration that participants are difficult to access for this purpose. Vale et al. recently recommended that PPI guidance be updated to routinely consider including participants as part of wider PPI plans . PPI contributors usually had personal experience of the condition under study (either as patients or carers), and this experiential knowledge was viewed by some as being a crucial attribute of PPI. Nevertheless, public contributors without such experience could bring advantages for the trial team too, such as impartiality and a greater ability to commit to the long-term trial in some medical contexts. This is consistent with previous research which identified the ‘expert in lived experience’ as only one of several potential roles embodied by PPI contributors . PPI contributors were recruited most commonly via a clinician on the team; other means had proved difficult for some participants, and a database or pool of interested people was suggested as a potentially useful resource for surgical trialists. Formal role descriptions for PPI contributors were not commonly used, but were viewed as a potentially useful tool for recruitment of suitable candidates. Reimbursement of PPI contributors’ expenses was common practice, but payment for time was less common, and participants had mixed feelings about the appropriateness of payment. Many of the challenges and views identified in this study are not unique to surgical trials and have been widely reported for PPI in clinical trials and health research more broadly, including tokenism, lack of clarity around PPI roles, difficulty recruiting and retaining PPI contributors, and issues around payment and funding [11, 16, 28–31]. We did not identify any unique, stand-alone issues that would apply to surgical trials but not to other types of trials, although the relative importance of some of the shared issues and uncertainties may differ (a question beyond the scope of this study). It is worth noting that some of the discourses identified in this study have been or could be critiqued. For example, the common view that some PPI contributors are too ‘professionalised’ for the role has been criticised as oversimplistic34. Some training and/or expertise is often helpful, and the degree and type required (or not) will vary according to the specific role. The cronyism of clinical investigators choosing favourite patients as PPI contributors was criticised but is consistent with the manner in which many other research team members (e.g. the statistician or health economist) are routinely chosen. It perhaps reflects the view that part of a PPI contributor’s role is to be a ‘challenging outsider’11 , and that this may not be possible if investigators have a tokenistic attitude towards PPI (deliberately choosing people they anticipate will be compliant) or if there is an inherent power imbalance, such as when clinical investigators choose their own current patients. Whilst involving current patients may be unwise, we would argue that choosing former patients with whom clinical investigators already have a positive relationship is not necessarily a bad thing, and in fact may be beneficial, since successful PPI appears to depend on establishing and maintaining good interpersonal relationships [26, 32]. Our survey yielded a high response rate relative to surveys of PPI practice in health research more broadly  and was not subject to significant response bias. However, our findings may be somewhat historical, since PPI practice is changing rapidly  and many of the trials in our sample began several years ago. PPI is likely to be even more common and more embedded now than it was when we conducted our survey. Another limitation is that this was not a true mixed-methods study, but rather a quantitative study followed by a qualitative study. While there was some overlap between the survey respondents and focus group participants, we deliberately sought a wider range of perspectives for the focus groups (including, for example, PPI contributors and research nurses); therefore, some of the surgical trials mentioned by focus group participants may not have been included in the survey and vice versa. Nevertheless, we believe that the qualitative dataset helps shed some light on the ‘real-life’ experiences and views surrounding the PPI practices identified in the survey. None of the focus group or interview participants questioned whether PPI should be performed in surgical trials, nor were we able to recruit any of the few survey respondents with negative beliefs about PPI, suggesting that the findings may not include the full range of views on this topic. Finally, we struggled to recruit eligible industry-sponsored trials to this study, succeeding with only one of eight identified. Our findings are therefore based almost exclusively on trials sponsored by academic institutions and the National Health Service and may not be generalisable to commercial trials. The findings of this study will inform the development of a robust PPI intervention aimed at improving recruitment and retention in surgical trials (PIRRIST), which enhances rather than duplicates baseline PPI practice. The findings may also help surgical trialists planning PPI for new trials; the survey findings provide a benchmark against which they could assess their plans (how do their PPI plans compare with their peers? ), while the focus group findings highlight some of the advantages and disadvantages of different PPI practices. Further research exploring how best to involve the public and patients in the design stage of surgical trials, including the benefits and challenges of involving trial participants as PPI contributors, would be valuable. PPI has started to become routine practice in academic- and NHS-sponsored UK-based surgical trials, most commonly involving one or two patients in advisory or oversight roles such as membership of the Trial Steering Committee. However, there is potential for, and signs of a shift towards, much greater and earlier involvement. We are grateful to everyone who took part in the survey, focus groups, and interviews for their time and generous contributions, and to all PIRRIST study collaborators and advisers who contributed to the design of the study and/or the recruitment of participants, including Jane Blazeby, Louise Bowman, Simon Denegri, David Evans, Rebecca Harmston, Allison Hirst, Emma Jones, Simon Knight, Laura Magill, Peter McCulloch, Michael Osborne, Adwoa Parker, Patients Active In Research, Rosamund Snow, and Tim Sprosen. We thank Sandra Pickworth and Kristy Ravenhall for providing administrative support; Heidi Gardner at the University of Aberdeen for taking notes during the focus group in Aberdeen; Ruth Aspinall of the Health Research Authority for providing NRES data to assess survey response bias; Murat Akkulak at the Royal College of Surgeons for providing the RCS portfolio of surgical trials; and colleagues who kindly piloted and helped to improve the survey including David Beard, Natalie Blencowe, Johanna Cook, Marloes Fransson, Emma Ogburn, John Powell, Alison Clarke, and Mary Sneade. This research was supported by the National Institute for Health Research (NIHR) Oxford Biomedical Research Centre (BRC) (NIHR-BRC-1215-20008) and by the Medical Research Council (MRC) Network of Hubs for Trials Methodology Research (MR/L004933/1-N66), as part of the wider PIRRIST project. The views expressed are those of the authors and not necessarily those of the NHS, the NIHR, or the Department of Health. The funders had no input into the study design, data collection, analysis, interpretation, or manuscript writing. The survey dataset analysed during the current study is available in an anonymised form (Additional file 2). Free-text data and some variables with unique responses have been removed to ensure anonymity. The focus group and interview transcripts are not publicly available but may be anonymised and shared for research purposes on reasonable request to the corresponding author. JCC, SR, LL, SO, AC, ST, and RB conceived the study. JCC, SR, LL, SO, AC, ST, RB, JAC, NF, KW, and JB designed the study. JCC collected and analysed the survey data; JCC and KPB collected and analysed the focus group and interview data, supervised by JH. All authors read and approved the final manuscript. The Health Services Research Unit, University of Aberdeen, is core funded by the Chief Scientist Office of the Scottish Government Health Directorates. The project was reviewed and approved by the University of Oxford Central University Research Ethics Committee (reference number: MS-IDREC-C1–2015-163). Informed consent was built into the beginning of the online survey, and was provided in writing by focus group and interview participants. Informed consent for the publication of anonymous data was provided by all participants. INVOLVE: what is public involvement in research? http://www.invo.org.uk/find-out-more/what-is-public-involvement-in-research-2/. Accessed 23 Feb 2015. National Institute for Health Research. Patient and public involvement in health and social care research: a handbook for researchers; 2014. https://www.nihr.ac.uk/about-us/CCF/funding/how-we-can-help-you/RDS-PPI-Handbook-2014-v8-FINAL.pdf. Popay, J and Collins, M (editors) with the PiiAF Study Group (2014). The Public Involvement Impact Assessment Framework Guidance. Universities of Lancaster, Liverpool and Exeter. Available at: http://www.piiaf.org.uk/documents/piiaf-guidance-jan14.pdf. Health Experiences Research Group: patient and public involvement in research. http://www.healthtalk.org/peoples-experiences/medical-research/patient-and-public-involvement-research/topics. Accessed 23 Feb 2015. National Institute for Health Research: NIHR Clinical Research Network Portfolio. https://www.nihr.ac.uk/research-and-impact/nihr-clinical-research-network-portfolio/. Accessed 26 Oct 2017. Jisc: BOS online survey tool. https://www.onlinesurveys.ac.uk/. Accessed 26 Oct 2017. Health Experiences Research Group: researchers' experiences of patient & public involvement. http://www.healthtalk.org/peoples-experiences/medical-research/patient-public-involvement-researchers/overview. Accessed 26 Oct 2017.